I had posted a little information about Roseau, Minnesota's BOA Hockey before, but I was doing a little research on stick-makers tonight when I discovered that they've been posting video to YouTube! Being that I am interested in a great company that is slowing carving a niche into the hockey market by being unique and innovative, these videos might be of interest to you as much as they were to me. Personally, I think my next stick is going to come from BOA, and watching these videos has convinced me that they have a solid grasp on the hockey stick manufacturing business. I have not been paid nor contacted by BOA Hockey to post anything on their behalf, so don't think that this is some sort of advertisement on their behalf. I actually believe in what they are doing, and the prices they charge for their sticks are quite reasonable. The fact that they bought the old Christian stick factory is another reason as I liked the old Christian sticks as I was growing up. In any case, let's take a look at these videos of BOA Hockey's processes. We'll start with the introductory marketing video, and then break into a few other videos that they have posted. None of the videos run longer than five minutes, so give BOA Hockey a few minutes of your time. You might actually be surprised as what they can do for you as a hockey player. Here's a tour of the BOA Hockey plant in Roseau, Minnesota! This video shows how fibreglass is applied to a wooden stick. The next video shows how resin is applied to a fibreglass stick. So there's an inside look at BOA Hockey's operations and facility. I'm actually pretty psyched about how they got in at the ground floor and are slowly building a nice little market for themselves. If I can swing it this summer, I think I may take a little roadtrip down to Roseau, Minnesota and see the guys and gals at BOA Hockey to get a first-hand view of their operations. If you want to learn more, hit up BOA Hockey's website and check out their products. Their prices are reasonable, and they can reproduce any blade lie that you prefer. Sounds like a pretty decent little company right? The Hockey Show hits the air tonight on 101.5 UMFM at 5:30pm CT, and we have a pile of stuff to discuss and disseminate. From teams folding to impressive personal performances to a new TV show by a friend of the show, we'll be talking a lot of stuff tonight. Strap yourself in and hold on tight because tonight's show is going to move. The Winnipeg Jets, their turn-around under head coach Paul Maurice, and their playoff chances. Evander Kane's infected hand, and how it may affect the team through the second-half of the season. The impending return of Paul Postma. Zach Redmond and his lack of ice-time while being called up. What to do with Ondrej Pavelec and Al Montoya. The renaming of the Phoenix Coyotes to the Arizona Coyotes. The Stadium Series games in California and New York. Have we overkilled the outdoor games? Ben Scrivens' 59-save shutout performance against the Sharks. Brian Rafalski's return and retirement from the ECHL's Florida Everblades at the age of 40. The folding of the ECHL's San Francisco Bulls mid-season. Friend Of The Show Jared Keeso's new TV series, 19-2. If you haven't seen the premiere episode, you can catch it here. Anything else we can squeeze in! Basically, if it happened over the last couple of weeks, we'll try to squeeze it in. We also will be taking phone calls and tweets on the show as we want to work your thoughts into the program. Call us tonight at 204-269-8636 (269-UMFM) to get your thoughts in on the topics above or suggest another one we should have a take on, and feel free to tweet me tonight at @TeebzHBIC with your thoughts. Or just to say hi. Whatever you like. It's hockey chatter night on 101.5 UMFM and you're invited! 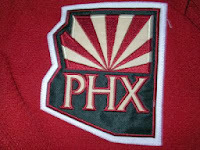 For years, we've known that the Phoenix Coyotes actually play in a city other than Phoenix. Glendale is the neighbourhood where one finds the Jobing.com Arena, home to the Phoenix Coyotes, and there has always been some contention about the geographical identifier attached to the team. The team has finally done the right thing, though, as they've rebranded themselves as the Arizona Coyotes for the 2014-15 season. The team will now represent the entire state rather than a city in which they actually didn't play. "We are very excited to announce our franchise name will change to Arizona Coyotes for the start of the 2014-'15 NHL season," Anthony LeBlanc, the club's co-owner, president and CEO, said in a statement. "Becoming the Arizona Coyotes makes sense for us since we play our games in Glendale and the city is such a great partner of ours. "We also want to be recognized as not just the hockey team for Glendale or Phoenix, but the team for the entire state of Arizona and the Southwest. We hope the name 'Arizona' will encourage more fans from all over the state, not just the valley, to embrace and support our team." The only changes that fans will notice will be the shoulder patch. The current patch will be replaced by a brand new patch that will be unveiled during the first preseason game next season. Other than that, the brick-red Coyotes jerseys won't change with the name change. Oh, and the shoulder patch for the alternate uniform will also change. So there will actually be two patch changes for next season unless the Coyotes are retiring the black alternate. There was no news of that happening, though, so I'll assume that both patches will change. With the Russian officials in Sochi making it very clear that there will be no safety concerns in Sochi for the upcoming Olympic Games, Hockey Canada's Bob Nicholson was asked today about a contingency plan if something were to happen before the Games began, prompting the NHL to pull its players out of the Olympics over safety concerns. This is a very valid question as the NHL has expressed that they would re-evaluate their participation if something were to happen. Mr. Nicholson's response was very candid. "Our contingency plan would be everyone around this room today," he said while speaking to reporters at Rogers Arena. "We have none." So that pretty much kills any thought of a Spengler Cup-like team going into Sochi and playing as Team Canada. I'm actually surprised by this move as Hockey Canada knew from the very beginning that there could be a chance that the NHL scrapped their involvement if things went off course in Sochi in terms of the safety of the players. And while I do think it's prudent that Hockey Canada not put any players' lives at risk over a hockey tournament, you'd think that they would be working behind the scenes to ensure a Canadian team participates, especially since Canada is the defending gold medalist. Either way, Hockey Canada's first priority should be the safety of its athletes. Everything else comes second. Kudos goes out to Edmonton's Ben Scrivens for his amazing performance tonight. The Edmonton Oilers tied a franchise record for shots-against in giving up 59 shots to the San Jose Sharks, and Scrivens simply stopped them all to set a new NHL record for most saves in a regular-season shutout. Scrivens, who stopped 20 shots in the first and 22 more in the second period, broke the 54-save shutout record set by Phoenix's Mike Smith against Columbus in 2011-12. It should also be noted that the 59 saves were the most since Quebec's Ron Tugnutt made 70 saves in a 3-3 tie at Boston on March 21, 1991. Dwayne Roloson of the New York Islanders previously held the high mark with 58 saves in a 4-3 overtime win over Toronto in 2009-10. Not bad at all for the guy that the Kings basically dealt to Edmonton just to make room for Martin Jones. Seriously: I'm completely on-board with Scrivens getting all three stars. Anything else is a travesty. I'm completely on-board with Mr. Willis. Simply an amazing performance tonight! Well done, Ben! 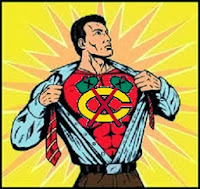 The Chicago Blackhawks beat the Vancouver Canucks tonight by a 5-2 score. Water, surprisingly, is still wet. The sun will rise in the east tomorrow. That's all for me tonight. It's already late, and this is being posted late thanks to the Board of Directors meeting I attended tonight. Tomorrow, The Hockey Show will get back to its normal format where we talk hockey for an hour, so tweet or call and we'll get you on the air! The man wearing #28 in the picture to the left is finally done with hockey. Brian Rafalski, who last suited up for the Detroit Red Wings in the NHL, wanted to give hockey one more shot before he finally called it quits for a career. He un-retired to join the ECHL's Florida Everblades about three weeks ago, but it appears that the career restart is now over as Rafalski has re-retired, this time for good. After being limited to just three games with the Everblades due to lingering back problems, Rafalski will step away from the game once more, knowing that he gave it one final shot. Rafalski will officially retire with a single assist in his three-game return with the Everblades. That single assist came on January 18 as Rafalski was the lone helper on Mathieu Roy's 16th goal of the season that came at 9:44 of the third period against the Orlando Solar Bears. In the three games that Rafalski played in, the Everblades went 1-1-1. According to reports, Rafalski's back acted up during his first game on January 10, and then had more problems in his next two games on January 17 and 18. "I'm done," Rafalski told the Fort Myers News-Press. "My back is no good. That was one of the hurdles. After playing two games, it inflamed the nerves in my back so I'm done. I felt like I played pretty well the last game. I was getting my timing and the game seemed to slow down." It appears Rafalski will remain in Florida and work with the team "as a spiritual adviser who holds chapel for the players". I'm not here to rain on anyone's parade, so good on Rafalski for helping the team off the ice if he cannot play on the ice. "He did a really good job for us, and we're grateful to have him for those games," head coach Greg Poss told the Detroit Free Press. "He's a really good person to have around the team. "He was battling back to get in shape but at the same time, when you get injured like that, it's hard to get in shape. You're fighting an uphill battle. It's just hard to play pro sports at 40." In other Everblades news, former University of Manitoba goaltender Jesse Deckert was a starter for the Everblades, but it appears his season is over already. According to reports, Deckert suffered a season-ending upper-body injury sometime in November before the ECHL club suspended him indefinitely on December 9, allowing them to open a roster spot for another goaltender. Deckert was 6-1-2 this season with the Everblades, posting a 2.71 GAA and a .891 save percentage. He recorded all nine of his starts between October 25 and November 9, and looked like he was going to make another incredible run like he did in the previous season with Florida. Along with Kristers Gudlevskis, the two goalies led the Everblades to a 8-1-2 record through the first eleven games before Deckert went down with his injury. The Everblades will soldier on without Brian Rafalski and without Jesse Deckert. They are tied for second-place in the South Division with their in-state rivals in the Orlando Solar Bears, but the Solar Bears do have a game in-hand. They trail the division-leading South Carolina Stingrays by 12 points, and currently sit in sixth-place in the Eastern Conference. Best of luck to Brian Rafalski in his re-retirement, and best of luck to Jesse Deckert as he works to get healthy once again! It feels kind of weird to write about the folding of a hockey team mid-season, but the ECHL's San Francisco Bulls have decided to close up shop after failing to find new ownership. After completing their first season of play in the Cow Palace, the Bulls confirmed today through a statement that they will not complete the final 32 games of the season. After all the success being touted recently about hockey in California, this puts a little tarnish on those achievements. 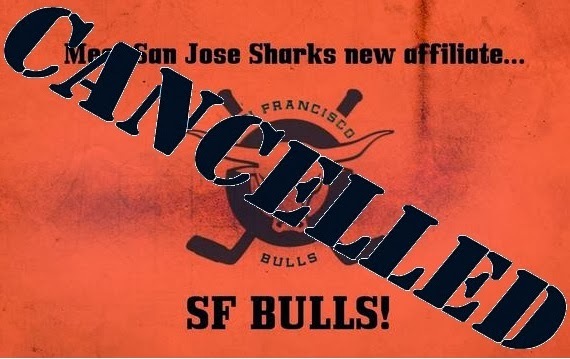 We regret to inform you that the SF Bulls are ceasing operations, effective immediately. The team was hoping to secure new ownership, however the terms of an updated deal were unable to be finalized, cancelling the remainder of the season. We want to thank all of our loyal season ticket and mini plan holders over the last two seasons. It’s been such a memorable time here with you in San Francisco, and we've especially appreciated all of your positive feedback over the past week. Thank you to those who went above and beyond to make us feel welcomed in the Bay Area, especially the members of the Matadors and Stampede. The entire organization is grateful. We had a great opportunity come to us that would've kept the Bulls in San Francisco at least through the end of the 2014 season, with potential for future seasons, but we ran out of time to complete all ends of the deal. At this point, the best thing to do financially is to reluctantly end the season. We will miss playing here, miss our fans, and miss this city. Bringing hockey to San Francisco was a dream; we have great talent on our team, and had a great vision for what the team could be. Things didn’t pan out the way we had hoped. It's sad, and disconcerting, but we're unfortunately left with no other choice at this point. For fans that have already purchased tickets to upcoming games, the Bulls Office will take requests for refunds up until February 28. Season ticket holders and single game ticket holders can contact their ticket reps for more information at admin@sfbulls.com. According to the ECHL's Collective Bargaining Agreement, all players under contract to the Bulls become free agents. San Jose, the NHL affiliate of the Bulls, had five players playing for the team, and all five will be re-assigned as per San Jose GM Doug Wilson. Those five players include JP Anderson, Kyle Bigos, Riley Brace, Sebastian Stalberg and Steven Tarasuk. While it's not unheard of to have something like this happen in the ECHL, it certainly comes as a surprise. The Bulls were 15-20-5 and fourth-place in the Mountain Division, just three points back of the Bakersfield Condors. They had recently beat the Stockton Thunder, who sit in second-place in the division, by a 3-2 score. Furthermore, Bulls' CEO Angela Batinovich four days ago seemed to indicate that the Bulls were going to see this through to the end of the season. Thank you for your support during this time, we appreciate all of the encouragement from our fans. During the ECHL Mid-Season Meeting, the Commissioner and Board of Governors granted our request for additional time to complete negotiations that would allow for the transfer of the San Francisco Bulls to a new ownership group. We are hopeful that these negotiations will be completed within the allotted time, and we currently have no intention to cancel any games. Apparently, Miss Batinovich's foresight was slightly off as the team didn't even make it to the following weekend! I understand the idea of keeping the interest of the fans positive, but it seems the idea of closing up shop was already a hot topic before Miss Batinovich's statement on January 23. If it wasn't apparent to Miss Batinovich, the cracks were starting to show from a fan's standpoint. It’s sad, but the Bulls moving/folding comes as no surprise. San Francisco is way too expensive for a minor league team. It's like a member of my family has passed. I love the San Francisco Bulls. Won't even get to say goodbye. While the Bulls seemed to benefit from the NHL lockout in their inaugural year, the cost of running the franchise in San Francisco seems to have done in the franchise. The Bulls were second-last in attendance this season, averaging just 2292 people per game over their 18 games at home this season. That's not a good number if you're into economics of hockey. Nor is this: the Bulls reportedly was on track to lose $2 million this year. Ouch. As the linked article states, playing in the decrepit Cow Palace - built in 1941 - put this franchise behind the eight-ball from the start when it came to costs. When they first were debuted, the Bulls' uniforms had contrasting name bars and they seemed to use the Anaheim Ducks' number font. 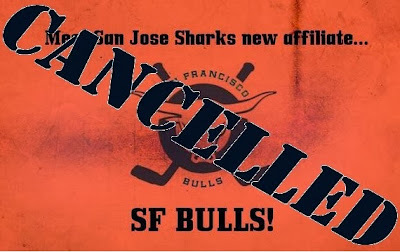 While the Sharks were partners with the Bulls, I can't imagine the Sharks were too fond of a California minor-league team they partner with looking an awful lot like one of their California NHL rivals. The Bulls went back to traditional block numbers as they played through their inaugural season and into this season, but they still held onto those contrasting name bars. And that's as far as we'll get in the San Francisco Bulls' jersey history as they have officially ceased all operations just a season and a half into their existence. Personally, I'm disappointed that no one stepped up to save this franchise or help it find a better location to play its game in. It sounds as though the Cow Palace is an absolute sinkhole for money, so perhaps it's better off this way. 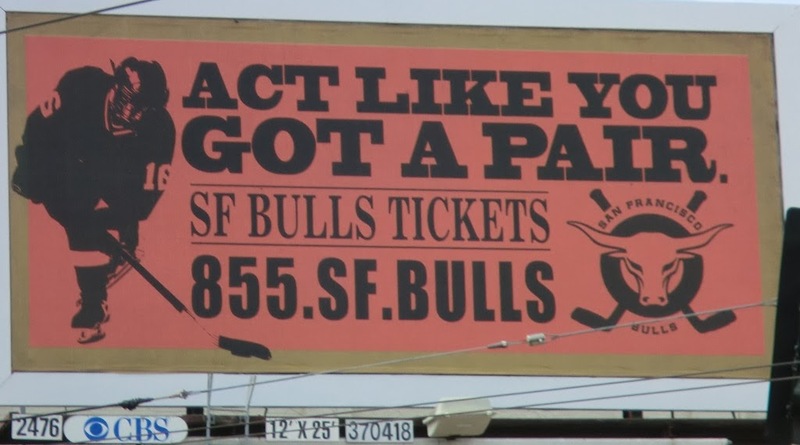 If there's one thing I will miss from the Bulls, though, it's their fantastic marketing department. Do you think an NHL club could get away with this? Last night's Stadium Series game played at Dodger Stadium between the Anaheim Ducks and the Los Angeles Kings was pretty good. Sure, Anaheim skated to a 3-0 victory, but there were hits, fights, music, fun, and over 54,000 happy fans. 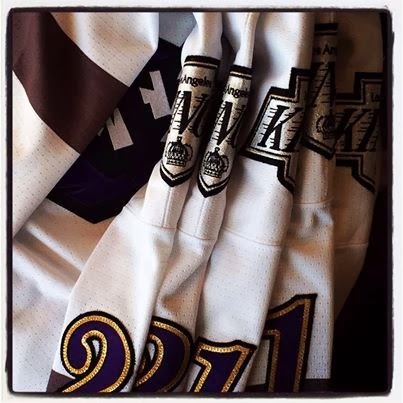 While I wasn't overly-enamored with the gray-versus-orange look, there was another Los Angeles uniform in action last night as the AHL's Manchester Monarchs honoured one of Los Angeles' greatest looks. Or worst. Your choice. The Monarchs held Los Angeles Kings Night at the Verizon Wireless Arena as they hosted the Portland Pirates, and the fans in Manchester went home happy as the Monarchs-turned-Kings scored with two seconds remaining in overtime to give the home side a 3-2 win. The man to the right, Linden Vey, scored the game-winner as the Atlantic-leading Monarchs handed Portland the loss. Portland finds themselves in fifth-place in the Atlantic Division after recording the loss. 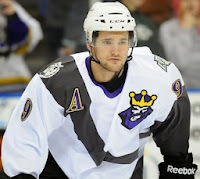 Amazingly, social media and blogs really helped the Monarchs into their Burger King jerseys. 75% of the online votes went towards the Burger King jersey, meaning that more than 7500 of the more-than-10,000 votes made online went towards the 1996 Kings' alternate jersey. Well done, internet! That's the kind of response I appreciate when it comes to a team looking to have a little fun! The thing that kills me that is that this uniform was worn a mere eight times in 1996 by the Los Angeles Kings as per the NHL's alternate jersey schedule. I know they were routinely condemned for how ugly they were, but there is a strong following within Los Angeles who support the Burger King jersey. Much like the Islanders' Fisherman uniform, it seems that the further time pushes the Burger King into history, the more people find appreciation for the uniform. 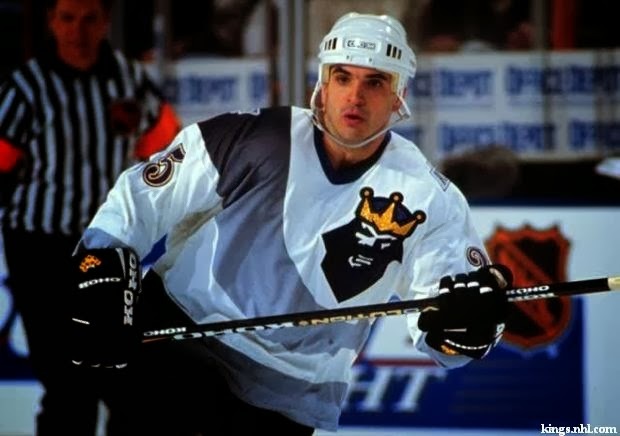 If there is one complaint, the Burger King logo on the left shoulder of the Monarchs is significantly smaller than it was for the Kings in 1996. Honestly, though, the Monarchs looked fantastic last night. There should be more fun jerseys done like this by more teams. Maybe we could see Anaheim bring back Wild Wing at some point? Will the Canucks ever throw back to the fading skate? Could we ever see the Bruins' Pooh Bear once more, perhaps worn by the Providence Bruins? Only time will tell, but let's not let this era in NHL history fade into obscurity. Well done, Manchester, in wearing the 1996 Kings' alternate jersey well! The title is a little misleading as there is hockey on TV on a number of channels, especially here in Canada. However, there has been a recent slate of TV shows that have featured hockey-related items that have been on TV or will be premiering on TV in the near future. While I certainly encourage people to get off their couches and head outside, sometimes there are reasons to stay inside and watch some TV. The above image came from the CBC as their newest "reality" show, Four Rooms, sees people from all walks of life bring in items that they feel are value in an effort to sell the item to one of the four investors/collectors. Shawn Chaulk, a construction company owner from Fort McMurray, Alberta, is a major Wayne Gretzky memorabilia collector who wanted to sell his 1981-82 Gretzky game-worn jersey, the same season when he posted an NHL-record 92 goals and 212 points. The link to the video is here, and I would have embedded it, but CBC doesn't allow embedding from their site. I apologize to American visitors - the CBC doesn't like you visiting their site either. I will tell you this: the bidding for the jersey was high. Mr. Chaulk wanted a minimum of $250,000 for Gretzky's jersey which he states could be sitting in the Hockey Hall of Fame. Chaulk acquired the jersey from a friend who had got it from the team's official photographer at the time. The highest amount offered by the four investors/collectors? $110,000. Mr. Chaulk will return to Fort McMurray with the Gretzky jersey after turning down the high offer made by Eddie Lobo. "Going in, I didn’t think it would sell but CBC wanted it for what it was — iconic and Canadiana," Chaulk told Marty Kilnkenberg of the Edmonton Journal. "I always had full intention of bringing it home with me. But it was fantastic exposure and a fantastic opportunity." Would you sell it for $110,000? Leave your comments below. I'd love to hear your thoughts. Lane Crockett from Victoria, British Columbia also wandered into the Four Rooms set after having amassed a huge Boston Bruins collection of stuff. The image to the right, a pair of old-time sticks gifted to him in 1969 by Bruins great Bobby Orr, will be a featured item on a future episode of Four Rooms. The sticks, one of which is autographed by members of the 1970 Stanley Cup champions, are encased in the display box and includes hockey cards from each player who signed the stick along with several of Orr. The sticks have a deep personal meaning to Mr. Crockett as well, and Don Descoteau of the Victoria News brought the story forth in his article. He underwent open heart surgery in a rare procedure at age 7 and as a post-surgery gift, his father searched out a Boston hockey sweater. When none could be found locally, he called the Bruins directly and the club sent a huge fruit basket, an autographed picture of Orr and other Bruins items. "I call it the healing power of hockey," said Crockett, who is healthy today. The young Victoria native's connection to Orr didn’t stop with the hospital gift. A few months later, Orr invited Crockett, a novice hockey player, to attend his skills camp in Orillia, Ont., where he gave him a pair of autographed sticks. Later, when Crockett was in Vancouver to watch the Bruins play the Canucks in their inaugural NHL season, Orr invited him into the dressing room afterward to meet the players. "(Bruin star) Ken Hodge pulled me in and said 'go get 'em kid.' I went around the room with one of the sticks and got everybody to sign," Crockett recalled. Pretty awesome, right? While Crockett and his wife Christeen - also a huge Bruins fan - cannot divulge the results of the show, he did say that a producer of the program called it "one of the most memorable moments in CBC sports television history." If you want to see that, the episode of Four Rooms will air tomorrow on CBC. Check your local listings! With the Sochi Olympics just a couple of weeks away, HBIC wants to take a minute to direct your attention to what sounds like a fantastic documentary that will Monday, February 24, 2014 at 10pm ET on PBS. Ice Warriors will take an in-depth look at the American sled hockey team as they work towards representing the country at the Sochi Paralympic Games in March. The one-hour prime-time PBS documentary will go behind the scenes as Team USA looks to defend their 2010 gold medal on Russian soil! From the release notes, "For ICE WARRIORS, the filmmakers gained unparalleled access to the US Paralympics Sled Hockey team. Beginning in September of 2013, the filmmakers accompanied the players at training camps and competitions, in the locker rooms and in the athletes homes, giving viewers an intimate, behind-the-scenes look at the arduous journey to Sochi. Along this journey, viewers witness the camaraderie of the teammates on and off the rink, learn about the personal triumphs and trials of the athletes, and see them at home with their supportive families." This documentary was produced by WGBH Boston with Judith Vecchione as the Executive Producder, Juan Mandelbaum as Senior Producer, Meredith Nierman as the Digital Executive Producer, while video production was done by Luminant Media under the watchful eye of Executive Producer Brian Knappenberger. I am very interested in seeing this documentary, and it's probably something you should watch as well. If you've never seen what some of these players go through just to play hockey for their country, you'll be amazed. These men are dedicated to their sport, and they deserve at least one hour of your attention. Watch on Monday, February 24 on PBS to see these men take to the ice! Being that he's a friend and an all-around great guy, I have to give some blog space to Jared Keeso who played Don Cherry in his CBC-produced biography. 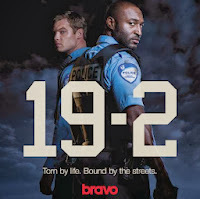 Jared's new series, 19-2, debuts this week on Bravo as the premiere happens on Wednesday, January 29 at 9pm ET. Jared is really excited for this series, and so am I. So let's take a quick look at who he's playing, who he's starring with, and why you should watch. Jared plays Ben Chartier, an honest, uncomplicated, and sensible man. Or so he seems. He bears emotional scars. His combination of affability and strict honesty serves him well on the job, but he arrives at Station 19 ill-prepared for the politics of a major police force. To his right, Adrian Holmes plays Nick Barron, a brooding beat cop with a reputation of a cowboy who regularly bends the rules. Outwardly, Nick is cool, even cocky, but inside he's tormented and ridden with guilt over the shooting of his partner Harvey. Nick is a man losing himself and at the limit of his self-control. Sounds pretty good, right? A couple of intriguing characters lead us into life inside Precinct 19 in Montreal. Nick is a veteran on Montreal's urban police force and has just returned from a three-month leave following the traumatic shooting of his partner. On his first day back, he is unhappy to learn he has been partnered with Ben, who has just transferred from a small town to restart his life in the big city. Both men are good cops, who deeply care about the job, yet struggle to move beyond painful events in their past. Ben and Nick must attempt to put their differences aside as their lives further intertwine, both professionally and personally, and continue to take surprising and dramatic turns. If you're looking for me on Wednesday around 8pm, I'll be off the grid entirely as I'll be glued to the television to watch Jared on 19-2. Expect a review on this blog, and some discussion about the premiere episode on The Hockey Show. I'll be looking for feedback to send to Jared as well, so make sure you watch and then drop by HBIC to leave a comment! That's all for tonight, kids. I'm going to watch the Ducks and Kings battle in Dodger Stadium. Have a good one! I had to laugh today when a few sites highlighted a heated online debate over Hayley Wickenheiser being named as Canada's flag-bearer in the Opening Ceremonies of the Sochi Winter Olympics. Apparently, there were some who felt that Sidney Crosby would be a better choice as the person who carried the flag at the front of the line of all the Canadian athletes. While I respect all that Crosby has done for Canada in answering the call, Wickenheiser's accomplishments wearing the red-and-white maple leaf cast a long shadow on all that Crosby has done. This will be the fifth time that Wickenheiser will suit up for Canada on the biggest stage for women's hockey on the planet. She has won three gold medals and a silver medal at the Winter Olympics, and even suited up for the Canadian softball team in the Summer Olympics. She has played in almost every international tournament, setting scoring records and appearance records all over the place. She is certainly one of the most-decorated women to have ever played the game, and she has been a driving force in helping to grow the women's game. With women's hockey being considered as something to drop due to the dominance by two teams over the past five Olympiads, there is no better time to have women's hockey pushed to the forefront, and having one of the best to ever suit up in the game carry the flag should show that Canada is committed to growing the game. 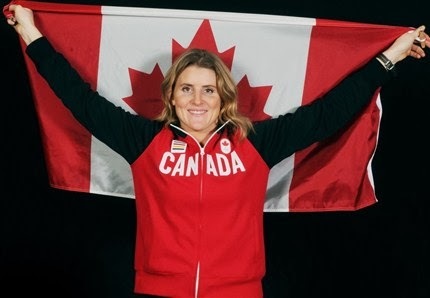 While the results of this Olympics may ultimately determine the fate of the sport at the Olympics, having Wickenheiser carry the flag sends a strong message about where the sport is in Canada. Could others have been awarded the honour? Absolutely. There are a number of fine Olympians who have dedicated their lives to representing Canada at the Olympics. All of them have sacrificed to make it to the level where they can walk into Fischt Stadium amongst the world's best athletes. Hayley Wickenheiser is one of those athletes who has given everything and been paid a pittance for all the work she has done. Sidney Crosby? He has sacrificed, but he's being paid quite handsomely for all those sacrifices now. If we're talking about the Olympic Spirit, this is something that Hayley Wickenheiser has had for nearly twenty years. This tournament is her Stanley Cup every four years, and she has routinely showed up and played her heart out in order to win women's hockey's greatest honour. She was very candid, but polite, in her comments after being named as the flag-bearer over Sidney Crosby. "For a lot of Olympic, amateur elite athletes, the Olympics is the stage," she told reporters. "For us, in women's hockey, the Olympics is our Stanley Cup. It's what we play for, every four years, it's what we strive to be — it is everything. So I personally do think the flag-bearer should represent those athletes that live most of their lives in this arena of amateur sport and elite sport outside of professional sport. But having said that, I look at our men's hockey team and someone like Sidney and think that someone like him carrying the flag... well, every single Canadian would be so proud to see him walk into that stadium, for what he does for hockey around the world." Now, I'm not hear to rain on Hayley Wickenheiser's parade. Some may question her speed and hands in terms of her being 35 years-old this year, but no one can question her heart, compete level, or tenacity. She loves winning, she loves competing, and she loves the game. But there was an interesting tweet sent out by Anthony Petrielli that I cannot validate as being true at this time. Funny Wickenheiser's the flagbearer because rumour was Dan Church (head coach) resigned because he wanted to cut her and Hockey CAN said no. So it needs to be asked, especially if this tweet is true: did Hockey Canada know that she was going to be named as the flag-bearer in December when the Dan Church resignation happened? Church was the man who cut Tessa Bonhomme - a move that was highly unpopular at the time - and now it appears he was set to send another popular, veteran player home in order to make the team younger and faster. Of course, I'm just speculating, but, if Mr. Petrielli's tweet holds water, there's something fishy going on behind the scenes at Hockey Canada. All in all, I'm quite comfortable with Hayley Wickenheiser carrying the flag. You should be as well. She's given her life to this country in terms of the countless times she has pulled on the sweater, and she's asked for nothing more than our cheers. That's the Olympic Spirit, and Hayley Wickenheiser has it in spades. The Hockey Show has a big show lined up tonight! It's award season across North America as Hollywood starts handing out awards like they're Halloween candy, but the music industry is gearing up as well! The Grammy Awards will be handed out in the USofA shortly, and the Canadian music industry will follow suit with the Juno Awards! And with the Juno Awards comes an annual tradition of a hockey game in the host city featuring a team of music talent against a team of former NHL talent! This year see the city of Winnipeg play host to the Juno Awards and to this awesome hockey game! Tonight, The Hockey Show is proud and honoured to welcome the three men pictured above to the show! These three men will be participating in the Juno Cup hockey game here in Winnipeg, so let's meet these three participants! The man on the left is the lead singer of the Juno award-winning band Eagle & Hawk! Jay Bodnar joined the band in 1998, and has led the band with powerhouse vocals and songwriting as the band became Canada's most-decorated First Nations rock group since his joining the band! Jay will join us tonight to talk about the Juno Cup, the band, the music, and the Juno Awards! The man pictured in the middle also is part of Eagle & Hawk, but is one of the founders of the band! Vince Fontaine founded Eagle & Hawk in 1994 with former Bombers placekicker Troy Westwood, and has been the lead guitarist and principle song writer since the band's founding. Mr. Fontaine is from the Sagkeeng First Nation in Manitoba, and we'll speak with him about the Juno Cup, his band's success, his influences, and the Juno Awards! As an aside, it should be noted that we're extremely proud to have Mr. Bodnar and Mr. Fontaine on the show tonight. While we rarely focus on music on The Hockey Show, Eagle & Hawk are one of Winnipeg's and Canada's most-decorated rock bands ever, having won 30 music awards including a Juno Award in 2002 for Best Canadian Aboriginal Recording for their album On and On, a Western Canadian Music Award and numerous Native American Music Awards, Canadian Aboriginal Music Awards, Aboriginal Peoples Choice Music Awards and Indian Summer Music Awards! WOW! The man on the right is a well-known face to hockey fans in Manitoba. Carey Wilson is a former NHL player, having played with the Calgary Flames, Hartford Whalers, and New York Rangers, before coming home to play a few games for the 1996-97 edition of the IHL's Manitoba Moose. The Winnipeg-born Wilson was a member of the first Canadian World Junior team to win gold in 1982, and represented Canada at the 1984 Sarajevo Winter Olympics! We'll talk with Carey about the Juno Cup, his hockey path, being a part of this annual tradition, and what he's doing today! Needless to say, today's show is going to be a big one. I encourage you to tune into The Hockey Show on 101.5 UMFM or listen live online to hear the details of the Juno Cup! It's going to be an exciting game where there will certainly be a few laughs, so we'll try and get details about you can attend the game. As always, you can tweet questions to me at @TeebzHBIC, and we'll get them on the air as well! There was an interesting report that broke today about the captains of Team Canada. According to reports, Team Canada captain Sidney Crosby sought approval from Chicago's Jonathan Toews before accepting the captaincy of Canada's Olympic team. I'm not sure how often something like this has been done, but that's a pretty impressive showing from Crosby in terms of showing respect for Jonathan Toews. While they may be bitter rivals on the ice, Crosby seeking Toews' approval is, in my view, the ultimate form of respect. "When we were taking about it, Sidney wanted to make sure it was OK with him, just for the fact he won a couple of Cups,” Babcock told reporters after the Wings' morning skate on Wednesday. "He's held in high regard, to say the least, and he's a huge part of the reason why they win as much as they do." There's no denying that Jonathan Toews is part of the engine that drives the Chicago Blackhawks. His intensity on the ice has earned him the moniker of "Captain Serious", and his drive to be better as he pursues a third Stanley Cup is relentless. In short, Toews demands a lot of himself in helping the team be better. If he was one of the choices to be the captain of Team Canada, that says a lot about the Winnipegger's game and how much the coaches respect what he brings to the ice. "He's earned the right to be a captain with Canada: two Cups, Olympic gold," Babcock said of Toews. "I don't know what else he's won. It seems more than that. He's a pro who does it right every day. He's a 200-footer. To me, he's an impressive, impressive man." That comment alone tells you how much Team Canada's head coach values the work ethic and skill that Toews brings to the ice nightly. To be a "200-footer" shows that Toews will be relied upon heavily in Sochi to carry this team, not unlike how he was relied upon in Vancouver to play tough at both ends of the ice. Toews is Canada's best two-way forward heading into the Olympic Games, and this validation from both the coach and arguably Canada's best player is another accolade Toews seems to sheepishly accept. "For Sidney to ask guys for approval, I don't think he needed to do that, but it shows the kind of guy he is," Toews said. "Everybody knows Sidney is the guy. I'm just honored to be in the conversation for the captaincy. One way or the other, I'm excited to accept a role like that. If it's more of a leadership role, I'm excited for the challenge." I'm not here to say that Jonathan Toews should be captain and Sidney Crosby should not. Crosby was a major part of the Olympic gold medal in Vancouver, and he should be given consideration as the team's leader in Sochi after leading the Penguins over the last four years to one of the best records over that time. He is arguably the best player on the planet, so Crosby as captain shouldn't be any surprise given his past performance at the Olympics and his body of work since those Games. However, Jonathan Toews has put together a pretty impressive resumé since the Vancouver Olympics as well. Toews was named to the Olympic All-Star team in 2010, was named as the tournament's best forward, and certainly played a large role in helping Canada win the Olympic gold medal. He then led his team, the Chicago Blackhawks, to a Stanley Cup in 2010 while being named as the Conn Smythe Trophy winner before adding a second Stanley Cup ring to his credentials in 2013. He's the second-youngest youngest Conn Smythe Trophy winner ever, and the youngest captain to win the trophy. Finally, he was the 2013 Frank J. Selke Trophy winner as the best defensive forward in the NHL. In short, Toews has had a pretty impressive four years since the last Olympiad. It's a pretty classy move by Sidney Crosby to recognize that Jonathan Toews might be an equal candidate for the captaincy of the Canadian Olympic team and to seek Toews' approval for the captaincy. While most may say that Crosby is a no-brainer in being named captain, it shows the level of respect that Jonathan Toews has earned within the hockey community to be sought out for his approval on this decision by his peers. Respect: it is earned, not given. And Jonathan Toews has the ultimate respect from his coaches, his peers, and this writer. Well done, Jonathan! I received an email today from a reader who wanted to know a little bit about HBIC Radio. I'll be honest when I say that I've been looking at making changes to how HBIC Radio works. To put it bluntly, the computer I was running it on simply wasn't getting the job done due to the multiple users on the computer. Changes were needed, so changes were made tonight. I have an older computer that I repurposed to be the machine that will run HBIC Radio exclusively. I also cut a few additional commercials and promos, and it's now running HBIC Radio extremely well. I'm quite happy with what I've done, so that's what went on at HBIC Headquarters tonight. And David? I vow to keep HBIC Radio updated, and thanks for the kick in the rear that you sent me via email. For everyone else, give it a click above and listen. You might find some of the stuff we cover to be pretty entertaining! The Winnipeg Jets head into Anaheim tonight where they will visit the arena where winning streaks go to die... unless you're the Anaheim Ducks. The Ducks are an incredible 20-0-2 on home ice this season, and are laying waste to every team that ventures into their arena. A co-worker of mine asked me today what I thought the score would be tonight, and I responded with a half-hearted "7-1" answer. However, it dawned on me that the score I gave may actually be completely wrong. I'm going on record here: the Ducks' streak ends tonight. Paul Maurice has the Jets playing well right now. They're far from being perfect, but there seems to be a business-first attitude around these Winnipeg Jets since Maurice arrived in Winnipeg. In terms of tonight's game, the Jets will need massive games from a few players, none more than Ondrej Pavelec, but the Jets match-up pretty well with the Ducks for one reason: speed. Make no mistake that the Ducks are big and talented. Getzlaf, Perry, Penner, Bonino, and Selanne are dangerous for the Ducks on any night this season, and all of them can use their speed and size to make things happen. But if there's one area that the Jets can exploit, it's the lack of foot-speed that the Ducks have on their blue line. There's some speed on the Ducks' blue line in Cam Fowler and Hampus Lindholm, but the guys who log a ton of minutes - François Beauchemin, Bryan Allen, Mark Fistric, and Ben Lovejoy - are not the most fleet of foot. If the Jets can target those players and attack with speed, it's going to cause problems for the Ducks. Paul Maurice has been trumpeting the speed of this Jets squad, so they'll have to bring it tonight in Anaheim if they want to cook Anaheim's goose. Of course, the Ducks could simply pound the Jets into submission if they like. The Ducks have just seven players under 200lbs., and have six players that stand taller than 6'2" in height. In other words, the Ducks are a big, heavy team. The Ducks steamrolled the Vancouver Canucks last Wednesday by a 9-1 score, and followed it up with a war in Chicago that they lost 4-2 before heading into St. Louis where they won 3-2. In other words, the Ducks played some tough teams in the last week, and came away with four of six points. Not bad at all. I expect tonight's game to be a battle. The Jets will need some excellent play from key players and, if they can grab a little luck along the way, a few bounces to go their way. While I'm not convinced that the Jets will actually lose 7-1, they still could get hammered tonight. But I'm calling it here: the home unbeaten-in-regulation streak ends. As for a score? I can't predict that. I've never been that clairvoyant. Let's go with 3-1 with an empty-net goal for the Jets. Who knows what the score will be? What I do know that is that the Jets might be able to exploit the slow Ducks rearguards with their speed, and take advantage of a team that just battled three solid Western Conference teams. I'm calling a Jets win. And an end to the streak! 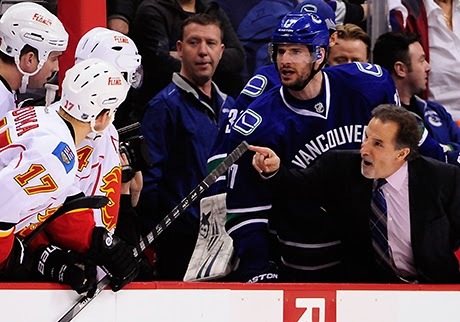 I don't blame John Tortorella for being irate over what happened at the start of the game between his Canucks and the visiting Calgary Flames on Saturday night. Some of you will disagree with me, and that's ok too. That's a healthy place to start this discussion since it takes two to tango. I love that Tortorella got angry and lost his mind over the starting lineup that Hartley rolled out onto Rogers Arena ice. And while I fully endorse the idea of Tortorella being suspended for what he did during the intermission, the NHL got it wrong by not handing down stiff punishment to Bob Hartley. Let's be honest here: if you're John Tortorella with the last change, do you really send out the Sedins and Kesler if you see Brian McGrattan, Kevin Westgarth, Blair Jones, Chris Butler, and Ladislav Smid standing at center ice? While I respect Brian McGrattan for what he's done off the ice, you know he's basically in Calgary's lineup for one reason only. Therefore, Tortorella did the only he could do, and he sent his fourth line over the boards to match-up against the Flames' biggest hombres. At this point, being the veteran coach that he is, Tortorella knew what was coming. And it's why he blew his stack during and after the line brawl concluded as seen above. This was a premeditated act by Hartley, and Tortorella knew how it was going to play out. In saying this, let's cut the crap that is pouring out from the Calgary side of the ledger here. Bob Hartley actually said with a straight face, "We had absolutely zero intentions there. Those guys are playing well for us. They got us a goal last game." Yeah, he said that. For real. Without laughing. To kick a little more phony in your face, he added, "As far as I know, they were the home team, so they had the luxury to put whoever they wanted out on the ice." Clearly, Hartley's having fun with this one. Hartley's right about the Canucks having the last change, but it's hard to get past the hulking fighters that Hartley put on the ice when considering who Tortorella is going to send over the boards. So cut the crap, Hartley, and admit that you were looking to light the spark that would set the powder keg off. Attempted and achieved, I'd say. If I was John Tortorella, I would have been irate as well. I don't know that I would have gone down the hallway towards the Flames' dressing room, but to each their own, right? It's that move - the stalking of the Flames' head coach into his team's dressing room - that will cost John Tortorella. How much, you ask? As of tonight, he's been given a 15-day, six-game vacation from the team by the NHL. He is to have no contact with the team in any fashion during this suspension which began yesterday. He'll also forfeit a pile of money during his two-week break, but that amount has yet to be nailed down in exact figures. In short, Tortorella was suspended two weeks for charging after Bob Hartley towards the Flames' dressing room in a fit of rage. Hopefully, that will be enough time for him to cool down. Twitter seems to want see Tortorella use this time off to its full advantage. Tortorella should spend the next two weeks camping on Hartley's lawn like the kid in "Eight Days A Week"
Not a bad idea, right? How funny would that be? In any case, Bob Hartley didn't escape punishment, but it seems like he got off way too easy considering that he instigated this spectacle. The NHL fined Hartley $25,000 for his contribution on Saturday night, but I feel that Tortorella's suspension is far heavier in light of how this entire debacle unfolded. Of course, Brian Burke feigned all sorts of disbelief over this fine in his comments, stating, "I am perplexed by this fine. I stand behind Bob Hartley completely in this regard and remain confident that he acted properly in every aspect of this game." If the NHL truly find this sort of behavior embarrassing, the NHL needs to fine Brian Burke and the Calgary Flames heavily just to send a clear and concise message that this horsepoop has gone far enough. They needed to suspend both Bob Hartley and John Tortorella for the same amount of time, and they need to issue a blanket statement to the rest of its teams explaining how this sort of staged crap won't be tolerated at any point in time at any level. "Unacceptable" would be just the tip of the iceberg for anyone even considering similar actions. Like a parent of two misbehaving children, you can't punish the retaliating child for being goaded into the fight, and John Tortorella was goaded into that fracas. The instigator has to be taught a lesson as well, and I think that Bob Hartley got off pretty easy. After all, it takes two to tango, and both Hartley and Tortorella need to share the blame and the punishment equally for their parts in what took place Saturday night. It sends a clear message that starting the fight will not be tolerated similar to catching the child who threw the retaliatory punch. But that didn't happen. Is Saturday night's dance one that the NHL really wants to see again? All the NHL did was show the rest of the league that starting the fight comes with no consequences. Is that the right message to be sending after branding Saturday's events as an "embarrassment"? I'm never one to say that the Hockey Gods keep score. People attribute coincidences with these hypothetical "Hockey Gods", and most will say that the Hockey Gods keep everything in hockey on an even keel. Throw a dirty check? The Hockey Gods will send one your way eventually unless you accept your punishment. Show up another team with a blowout? The Hockey Gods will frown upon the liberty that you took by awarding a blowout against you. Score a goal that perhaps you didn't deserve? The Hockey Gods will right that situation in time as well. Remember when the Los Angeles Kings played the Columbus Blue Jackets on February 1, 2012 and they scored a goal because the clock malfunctioned? If you don't, this should help your memory. The game clock in Los Angeles paused at the 1.8-second mark, allowing the Kings to score a goal that otherwise would have been disallowed. At the end of the 2011-12 season, the Columbus Blue Jackets would find themselves dead last in the NHL with 65 points, but the Los Angeles Kings qualified as the eighth-seed in the Western Conference with 95 points. They were five points better than the Calgary Flames, but the loss of one point in the course of a season may have played out differently. I should note that the Los Angeles Kings also went on to make a couple of key moves that helped them along the way in getting to the eighth-spot in the Western Conference and eventually winning the Stanley Cup that season, so maybe the Hockey Gods had simply erased that unearned goal from the ledger? While the Kings certainly helped themselves by acquiring a couple of players to help them get into the playoffs and eventually win the Stanley Cup - the Hockey Gods reward those who work hard as well - it appears that not all was forgotten by these Hockey Gods. There was still a disturbance within the Hockey Spectrum based on evening up that goal in Columbus. Here's what happened last night in Detroit. What looked like another two-point night for the Los Angeles Kings turned out to be just a single-point night after the Red Wings won in the shootout. Niklas Kronwall was given credit for the goal that was scored, and even he thought it shouldn't have counted. "It shouldn't have counted, but at this stage of the game, where we are in the standings, we'll take it," Kronwall said. "I don't think anybody knew where the puck was. You look at the guys and everybody was waiting, 'where is it?' Then it bounced off the goalie's back and in." 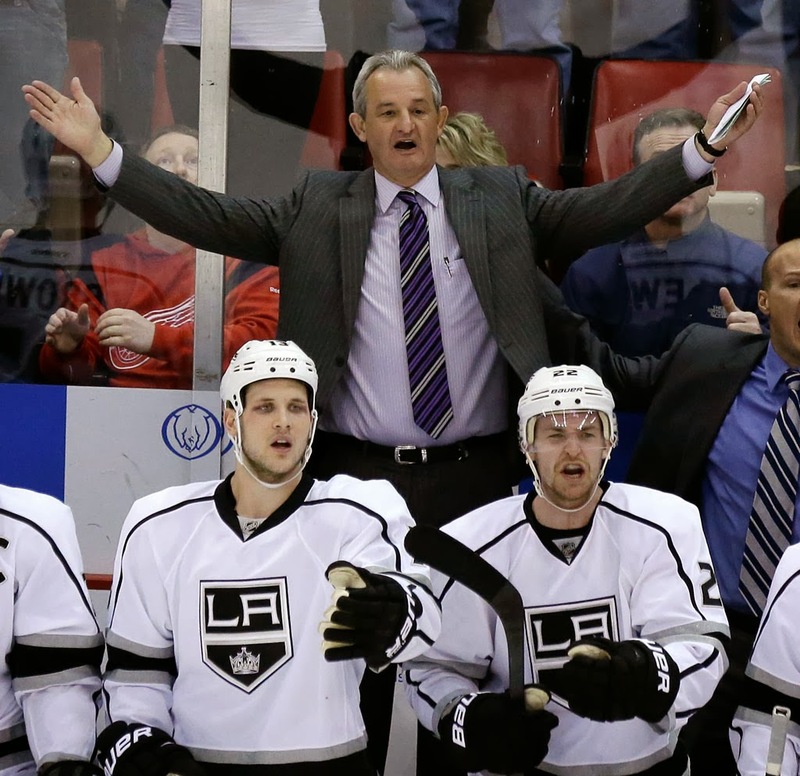 Of course, the Los Angeles Kings were in stunned disbelief. You had to think that this would be clarified by the league offices, right? Well, they issued a statement that stated that the "video of the play appears to show the puck hitting the protective mesh above the glass before deflecting off goaltender Jonathan Quick and into the Los Angeles net. While the Situation Room examined the video, this is not a reviewable play therefore the referee's call on the ice stands." Instant karma from the Hockey Gods. So will this have an effect on how these teams finish? Los Angeles is currently in third-place in the Pacific Division, four points behind the San Jose Sharks as of today. Both have played 49 games and both have 23 regulation and overtime wins. In other words, this could cost Los Angeles home-ice advantage in their opening-round playoff series. Detroit, however, needed the two points. They currently sit in fifth-place in the highly-competitive Atlantic Division at 52 points, three points behind the Toronto Maple Leafs. They needed to keep pace with the Male Leafs who won last night, and they did that with the two points. However, they can also cross-over if they end up with more points than the fourth-place team in the Metropolitan Conference. That team? The Columbus Blue Jackets who have 52 points. I don't subscribe to the Hockey Gods theory, personally. I just find it funny that the Los Angeles Kings, who earned some free points two seasons ago against Columbus, lost a point on a rather controversial goal to a team that is battling the Columbus Blue Jackets for the final playoff spot in the Eastern Conference. Or maybe the Hockey Gods simply don't like the Columbus Blue Jackets? The border city of Lloydminster was on display today across the entire CBC network as Lloydminster hosted Hockey Night in Canada personalities for the 2014 edition of Scotiabank Hockey Day in Canada! Lloydminster, as shown in the image above, is uniquely positioned on the Alberta-Saskatchewan border so that the city exists in both provinces. Because of this, Hockey Day in Canada spans two provinces in terms of the celebration! There were a lot of things to highlight from today and the last couple of days, so let's get cracking on the biggest day for hockey across Canada! I have nothing but the utmost respect for Ron MacLean and all the work he has done for hockey in this country. He's an icon on his own outside of his partnership with Don Cherry, and he genuinely loves the game of hockey. And while I get that Lloydminster sits on the border of Alberta and Saskatchewan, there's absolutely no need for this abomination. Sure, I get that Saskatchewan's only pro team is the CFL's Roughriders, but there's no reason to destroy two jerseys. That's horrible. The influence of Don Cherry on hockey hasn't been lost on Lloydminster. The Lloydminster Bobcats of the AJHL decided to get into the act and honour the man who dropped the puck for the ceremonial face-off tonight by donning incredibly-fantastic uniforms based on Don's wardrobe. I'd love one of these uniforms for my own collection. 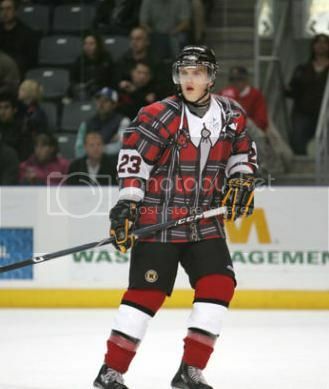 They follow the OHL's Kingston Frontenacs who wore their own Don Cherry-inspired jerseys in 2009. Lloydminster also honoured Ron MacLean. When he's not on Hockey Night in Canada, MacLean is an amateur official and works as often as he can in the stripes. The boys in stripes in Lloydminster will work the game tonight in Ron MacLean-inspired uniforms as well! CBC posted a fantastic infographic on their site yesterday about all the players born in Lloydminster who have played in the NHL. I was not aware that there were that many players who hail from Lloydminster. And knowing is half the battle. I'm not sure if Allan Muir is trying to raise the ire of Winnipeg Jets fans, but the SI.com NHL fan misery rankings put Jets fans at #10. I appreciate what Mr. Muir is doing in breaking down the problems with Winnipeg's current situation thanks to the debacle that happened in Atlanta, but there's no reason to think that Winnipeg fans have suffered in the three years they have been back in the Manitoba capital. Sure, there have been frustrating times, but to lead off the "fan misery rankings"? Someone, Mr. Muir, needs to visit Winnipeg more often. You know what makes Scotiabank Hockey Day in Canada even better? A goalie scrap. The Manchester Monarchs and the St. John's IceCaps decided to settle things with fisticuffs after things got out of hand in the Monarchs' 6-0 win tonight. Honestly, it doesn't matter if you attend the game and see the home team lose 15-0 if there's a goalie fight. I know there are a lot of rookies out there having great seasons, but is it too early to start the #voteforTrouba campaign? I'm pretty sure that Jacob Trouba of the Winnipeg Jets has been the best defenceman on the Jets this season, and his two goals today show that he's just as effective in the offensive zone as he is in the defensive zone. Start it up, kids: #voteforTrouba. 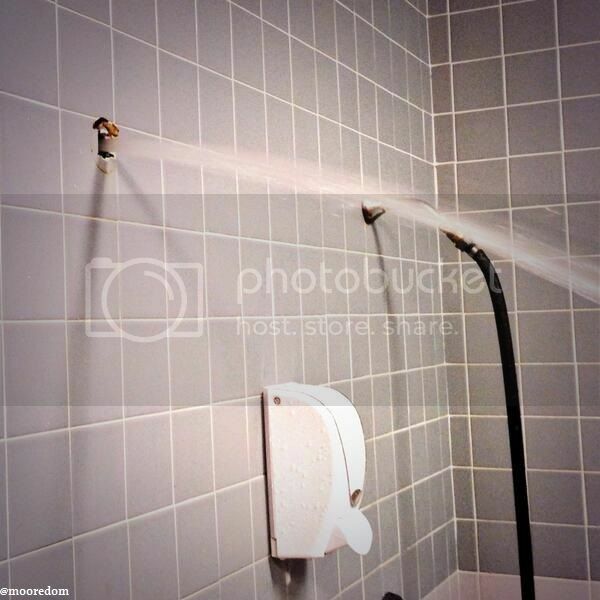 Dominic Moore of the New York Rangers found out that the water pressure in Ottawa might be a little high. Wow. 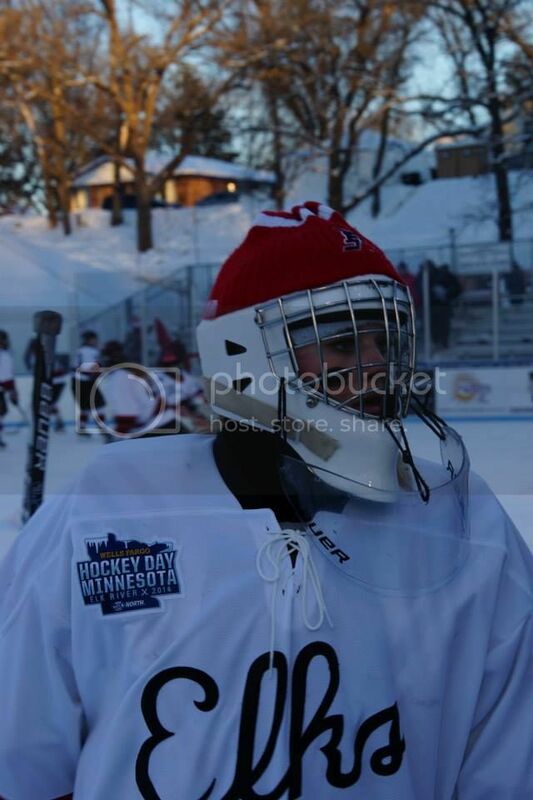 The eighth annual Hockey Day in Minnesota also happened today from Elk River, Minnesota! There were some great games played in "the state of hockey" today, most notably from the impeccably-dressed Elk River girls team! Those uniforms are made by Vintage Minnesota Hockey, and they look fantastic! I'm not familiar with the team, but I'm going to assume that Michaela Gould wore the slightly undersized toque over her mask. Still looks good, though! 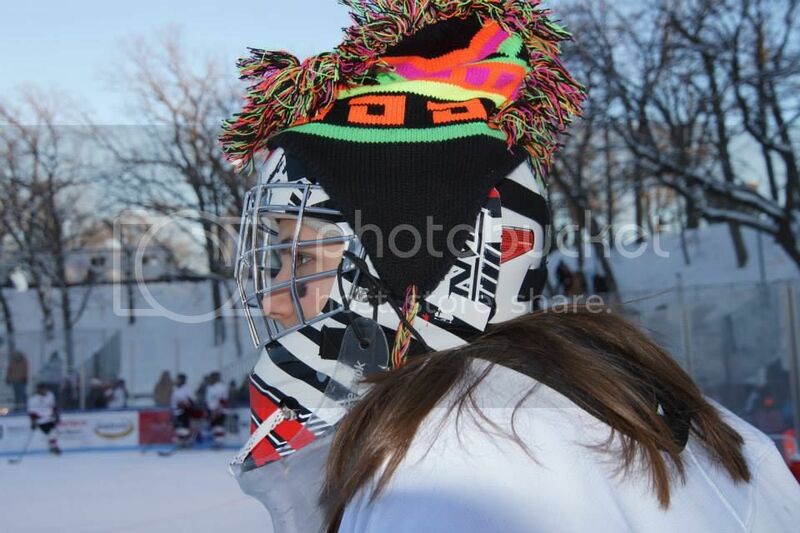 Jessica Edwards, who replaced Gould with eight minutes to play in the 3-0 loss to the Anoka Tornadoes, wore the traditional hockey sock toque over her mask. It's not that I like calling out teams who wear logos from other teams, but Anoka appears to have a history of using established logos. It appears they wear or have worn two familiar logos on their uniforms: the Oakland Athletics and the Atlanta Flames. Where's the originality? The Maple Leafs wore their Winter Classic jerseys today versus the Montreal Canadiens. Again, make this the alternate. It's gorgeous. Do it, MLSE. So there's a little hockey fun for Canada and Minnesota on January 18. We got to see some great uniforms that we rarely see, we got to see some great hockey action, and we had some fun learning all about the city of Lloydminster. Sounds like a pretty nice Hockey Day in Canada! I have a deep respect for the goalie mask. It's literally the only thing standing between a goalie's head and a rubber bullet. I also appreciate the vast artwork that goes onto the masks across the hockey spectrum, and there's no shortage of masks that should be in art galleries. Combining these two factors make the goalie mask one of the most impressive pieces of equipment in any sport, and they are extremely hard to miss. Unless you're Brian Elliott's mask which no longer looks like a mask as seen above. It appears to have been crushed! How? That's a mystery that still has yet to be be solved, it seems. 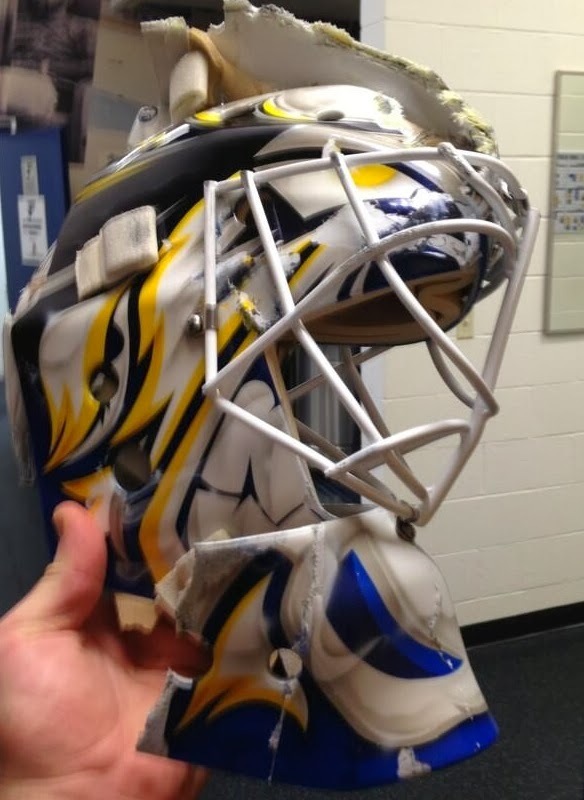 That's the final result after Elloitt's mask was crushed at some point between Thursday evening and tonight. These images came from Elliott's Twitter feed, but there was very little information given out as to exactly what happened to his mask. An Alex Pietrangelo slapshot? Run over by David Backes in practice? No, it appears something bigger did this. My guess? I think the mask accidentally ended up underneath the Blues' equipment truck and it was mistakenly run over. While these masks are designed to help protect the noggin when facing 100mph slapshots, I'm not certain they can withstand the weight of a cube truck rolling over it. I had hoped Elliott has been in some sort of high-speed chase with hostages that he saved by using his mask to thwart the kidnappers by tossing it under the getaway vehicle. Alas, that appears not to be the case. Needless to say, Brian Elloitt will have to use an old mask now or get himself a new one quickly. Forgetting protecting the head. Someone needs to protect the mask! The Hockey Show hits the airwaves tonight at 5:30pm CT on 101.5 UMFM with a special guest! We always strive to cover as much hockey as possible, but it was becoming dreadfully obvious that Beans and I had been giving little coverage to two categories: women's hockey and the NCAA. With the Olympics less than a month away, women's hockey will take center-stage as both the Canadian and US teams look for gold in Sochi. The NCAA, of course, is one of the best amateur hockey programs on the planet, but we've barely even mentioned the teams that are making waves at the collegiate level. We'll take care of both of those problems today with our guest! Nicole Haase joins us from Wisconsin tonight where she watches a pile of Badgers hockey and has been following the US women's national team as they prepare for Sochi. Nicole had the pleasure of seeing a few of the Canada-US exhibition matches, so she'll have first-hand reports of what these two teams need to do to win gold in Sochi. And because she follows one of the most-storied NCAA programs in the country, she has good knowledge on both the men's and women's programs in the NCAA and who the teams are to watch as they gear up for the Frozen Four! 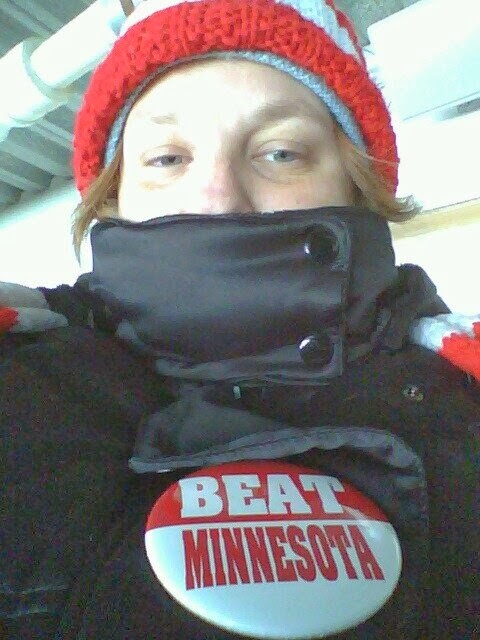 And if it means anything, the Badgers women's team plays Minnesota State tomorrow night and on Sunday. Should be a couple of beauty games! Tune in tonight as we talk women's Olympic hockey, the NCAA, the Wisconsin Badgers, and living in Wisconsin with Nicole Haase! We'll also toss some Jets chatter in there as they play the Calgary Flames tonight in the second game of the Paul Maurice era, and we'll close out by looking at the surging Manitoba Bisons hockey teams as the second-half of CIS hockey is underway! Find us on your radio dial at 5:30pm CT tonight on 101.5 UMFM or online at www.umfm.com! Tweet us any questions you have at @TeebzHBIC and we'll get them on the air for Nicole to answer! PODCAST: The podcast is now up! Download it here! BONUS VIDEO: Courtesy of thebiglead.com and tweeted to me by Nicole, this might be the coolest pass you see all year. Kevin Clark and Adam Courchaine are a pair of Canadians playing for the Krefeld Pinguine in the DEL in Germany. Off a face-off, Clark lost his stick when an Adler Mannheim player knocked it from his hands while going for a poke-check. Check out the move by Courchaine as the two men back-check. Anyone wanna take a shot at how often we'll see that highlight? Wanna Be Part Of Something Big? If it hasn't been mentioned enough on CBC's Hockey Night in Canada, I'll mention it here. This Saturday's broadcast will be from the city of Lloydminster, sitting on the border of Saskatchewan and Alberta, as CBC presents Scotiabank Hockey Day in Canada, and the vast majority of the CBC crew either is there now, will be arriving today, or will be getting there before Saturday for the broadcast. The problem is that Canada is a massive country, making traveling from places like Halifax, Moncton, Quebec City, and Ottawa to Scotiabank Hockey Day in Canada more than just an afternoon outing. Thankfully, the good people at Scotiabank have reached out to me in an effort to get more people involved in Scotiabank Hockey Day in Canada than ever before. And you could win some free gear while participating! Starting today and running through January 18, Scotia Hockey Club's social accounts will be extremely active as they build towards Saturday. There will be a ton of activity on their Facebook account. There will be a ton of tweets coming out from their Twitter account. Their Instagram account will be flooded with photos and stories. In other words, Scotia Hockey Club will be busy over the next few days. How can you be involved? Well, Scotia Hockey Club is "asking our community to share feel-good hockey community stories with the hashtag #scotiahockey. This could be a photo of their hockey team giving back to their community, or a story of someone they know who does good in the hockey community. Throughout the event we'll be highlighting some of these stories, and will randomly select a winner at the end who will be awarded an NHL Alumni visit to their town. Secondary prizes will be custom videos from NHL Alumni highlighting the winners' stories." Pretty cool, right? An NHL alumni visit to your town simply for posting your story on Facebook, on Twitter, or on Instagram with the #scotiahockey hashtag! That's a pretty easy contest to enter since virtually everyone uses some sort of social media site now. So let's get this going! If you follow me, you'll notice a ton of #scotiahockey tweets for the rest of the week as well as a number of retweets with the #scotiahockey hashtag. If I somehow win the NHL Alumni visit, I will award the visit to a follower of my Twitter account. Right now, there are a couple of hundred people following me on there, so your chances of winning this through my Twitter account is pretty good. Again, it all depends on whether I win or not, but I will give it to someone who follows me if I win. Guaranteed. All you have to go is hit social media between January 15 and 18, use the #scotiahockey hashtag to get entered to win the NHL Alumni visit or one of the secondary prizes. If you want to double your chance at winning, follow me on Twitter and your name is in the contest if I win any of the prizes. Pretty easy, right? The best part? You're now part of the biggest day of hockey in Canada. 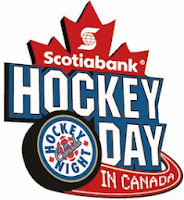 Sure, it would be great to in Lloydminster for the fun involved with Scotiabank Hockey Day in Canada, but at least Scotia Hockey Club can bring Scotiabank Hockey Day in Canada to you through social media. So get in on the fun. Tune into CBC on Saturday for the biggest hockey day this country has to offer. Enjoy the stories and pictures from players, fans, and teams across Canada through social media over the next few days. We're all a part of Scotiabank Hockey Day in Canada in every Canadian community! There's always talk about how players start with a clean slate when a new coach takes up residence behind the bench. There's chatter about new beginnings and opportunities that may not have been there before under the old regime. Teams often see a boost in their energy and work ethic after a coaching change as every player goes back to auditioning for more ice-time and great responsibilities. But did anyone expect the Winnipeg Jets to absolutely dominate the Phoenix Coyotes as they did last night after their recent stretch of uninspired play? We'll start there are we bounce through some news stories on Tuesday. The Winnipeg Jets, despite giving up the first goal of the game to the Coyotes on the power-play, absolutely crushed the souls of the Coyotes last night in their 5-1 win on MTS Centre ice. Winnipeg out-worked, out-hustled, and out-everythinged the Coyotes en route to a fantastic night at the Phone Booth. Again, the change behind the bench could be a big reason why this team was out-gunning the Coyotes at every turn, but if this team needed an "identity", as Claude Noel would say, last night's game should be on permanent replay in the Winnipeg Jets' video room and dressing room. That was easily the best game this team has played in months. In fact, maybe ever since arriving in Winnipeg. Everyone that stepped on the ice for the Jets should be proud of the effort they gave, and work towards replicating that effort going forward on a a daily basis. It is that kind of work ethic that will not only win games for this club, but win over a vast amount of fans in Winnipeg and across the hockey spectrum. Hard work can beat skill on any given night. That message was on full display last night as the Jets showed the willingness to work hard to generate chances. I give Paul Maurice credit for adjusting things on the fly as he was regularly seen talking to players as they sat on the bench. He's an excellent coach, sees the game very well, and should be able to provide a lot of guidance to a young club. Credit should also go to former Jets coach Claude Noel. It was still his system that the Jets ran last night, and they showed that it does work if everyone puts in 100% effort. It's apparent that Noel couldn't get the most out of the players nor would the players give him everything, but the system worked last night flawlessly. The Jets get a couple of days to work with Maurice before arriving in Calgary to battle the Flames, a team that finds themselves seven points back of the Jets this morning. The Jets need to continue to play this up-tempo, hard-working style of play against the Flames after they shut out the Hurricanes last night. However, if this style of play can be replicated, I have a feeling that the Jets will douse the Flames on Thursday pretty quickly. It isn't the first time that the Los Angeles Kings have supported the Major League Baseball team in La-La-Land, but this time it was done with a purpose. The Stadium Series in Dodger Stadium game will soon be upon us, and the ice-making crew and trucks rolled into SoCal yesterday. 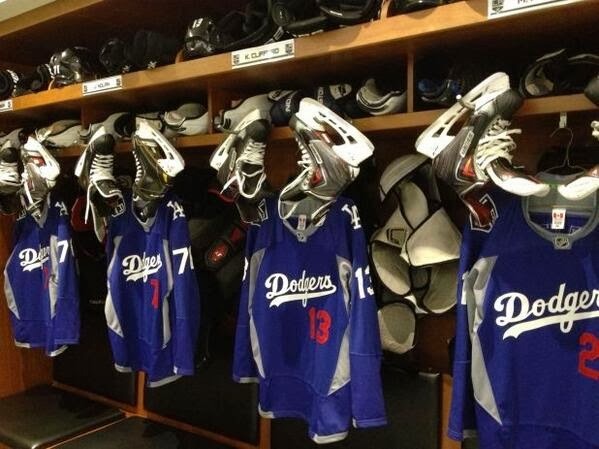 To get the ball rolling, the Los Angeles Kings donned their Los Angeles Dodgers warm-up jerseys before their game against the Canucks last night. 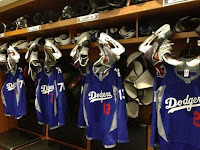 I actually find these warm-up jerseys to be pretty decent in that they really do look like the Dodgers' blue uniforms. Of course, they have worn these uniforms before. Dustin Penner looks absolutely huge in that jersey. Pretty cool news out of St. John's, Newfoundland where it was announced that veteran IceCaps forward and former Manitoba Moose Jason Jaffray would be the captain for this year's AHL All-Star squad. This year's All-Star Game format will be different from past years where Team Canada made up of Canadian AHL all-stars played against Planet USA made up of international and American AHL all-stars. Instead, the AHL All-Star team will play an exhibition game against Färjestad BK of the Swedish Elite League in both the game and the annual Skills Competition! This should be good! The roster for the AHL All-Stars include forwards Brett Connolly (Syracuse Crunch), Brian Gibbons (Wilkes-Barre/Scranton Penguins), Mike Hoffman (Binghamton Senators), the aforementioned Jason Jaffray (St. John's IceCaps), Travis Morin (Texas Stars), Brandon Pirri (Rockford IceHogs), Colton Sceviour (Texas Stars), Colton Sissons (Milwaukee Admirals), Ryan Spooner (Providence Bruins), Ben Street (Abbotsford Heat), Ryan Strome (Bridgeport Sound Tigers), and Linden Vey (Manchester Monarchs). The defencemen on the squad include Chad Billins (Abbotsford Heat), TJ Brennan (Toronto Marlies), Cody Goloubef (Springfield Falcons), Alexey Marchenko (Grand Rapids Griffins), Brayden McNabb (Rochester Americans), and Frederic St. Denis (Springfield Falcons). The net will be protected by Jake Allen (Chicago Wolves) and Martin Jones (Manchester Monarchs). Something I think is cool? Brayden McNabb, with his inclusion to the AHL All-Star Team, will now have played in an outdoor game, the Spengler Cup, and against a Swedish Elite League team all in the same season, meaning he's played against teams from Canada, the US, Switzerland, Sweden, and Russia all in the same year. The only country he's missed out on? The Czech Republic as the Rochester Americans and HC Vitkovice didn't meet up at the Spengler Cup. This doesn't require a lot of chatter, but the 2015 NHL Entry Draft will take place in Sunrise, Florida, the home of the Florida Panthers. This will be the second time the draft has been hosted by the Panthers after the 2001 NHL Entry Draft took place there. Ilya Kovalchuk went as the first-overall pick to the Atlanta Thrashers in that draft. The 2014 NHL Draft will be hosted by the Philadelphia Flyers on June 27 and 28 at the Wells Fargo Center. I am very excited to see the three-part mini-series that TSN is producing called Reorientation. The series will examine the changing culture of homosexuality in North American professional team sports from a once-homophobic culture to an accepting culture thanks to the work done by athletes and officials, especially the You Can Play movement. Former NHL defenceman and current TSN analyst Aaron Ward sits down with a number of players across the sports world to discuss the changing culture in the game and in locker rooms. Looks like an outstanding series, and I commend TSN for airing this at a time when athlete sexuality is at the forefront. Each segment will premiere on the 6pm of SportsCentre starting tomorrow and running through Friday. Check your local listings for times and channel listings! That's all for today as I feel like I'm caught up quite nicely with the on-goings in hockey. Speaking of the TSN piece, Hockey Blog In Canada firmly stands beside any athlete who has already stepped forward, and will 100% support any athlete who may want to step forward. I don't care if you're gay, straight, white, black, tall, short, thin or fat. If you can play, you can play. So play on, kids! There was a pile of stuff happening in the hockey world this weekend that I never got a chance to post, so we'll bring everyone up to speed today. 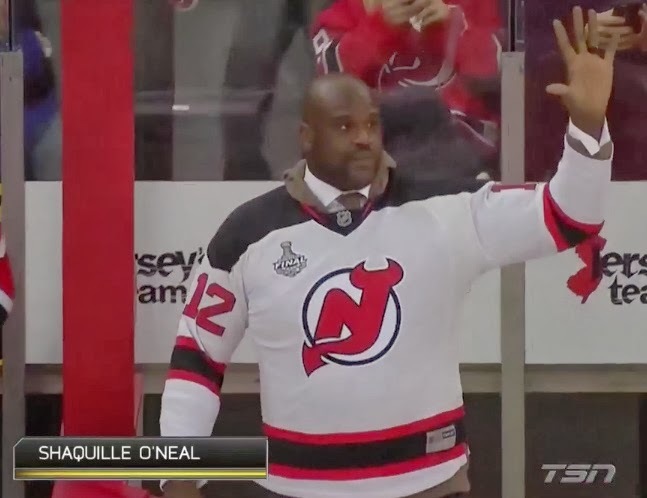 Yes, that is Shaquille O'Neal in the New Jersey Devils uniform. Yes, that might be the biggest skin-tight jersey I've ever seen. 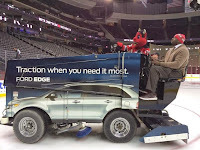 Shaq was in New Jersey this weekend and he was at the game on Saturday night between the visiting Florida Panthers and New Jersey Devils. That's where we'll start as we look around the NHL from the weekend. 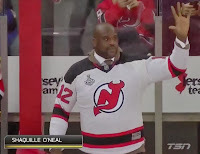 Shaquille O'Neal, the 7'1" former NBA star, was on-hand on Saturday night as a guest of the New Jersey Devils. 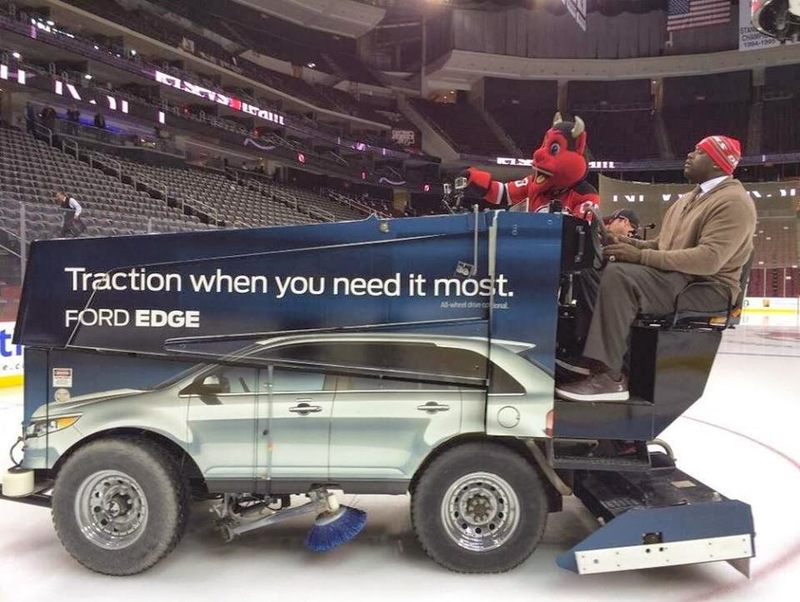 The 41 year-old Newark, New Jersey native was invited down to the Prudential Center before the game where he got to drive the zamboni! That's a size-23 shoe on that gas pedal, folks! Shaq donned the jersey as seen above, and then dropped the puck for the ceremonial face-off before the game. The only question I have is why he wore #12. Alexei Ponikarovsky is a bigger guy, but nowhere near the size of Shaq. Couldn't the Devils have given him his own jersey with "O'Neal" and #32 on the back? Ryan Miller was named to the American Olympic team, and there were questions as to why he may be going when he's playing for the worst team in the NHL. Sure, his stats have been great, but he hasn't exactly stolen any games for the Sabres this season. That is, until yesterday. Check out this save on Mikhail Grabovski. Think he's gearing up to be the starter in Sochi? That save was made with 2:14 remaining in the game, helping the Sabres get to extra time with the Capitals. And wouldn't you know it, but the Sabres won the shootout, making that save all that more important. Amazing save, Ryan Miller! Patrick Kane is second in league scoring this season. He's having a pretty good season on all accounts, and certainly is looking like one of the most dangerous scorers for the Americans as the Sochi Olympics approach. However, I'm pretty certain the Americans don't want to see this happen while playing in Russia in February. Ouch. You never really want to see that happen to a player in any circumstance. 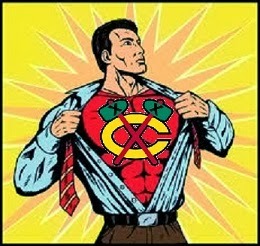 In saying that, Kane and the Blackhawks did rally shortly after on the power-play, skating to a 5-3 victory over Edmonton last night. The Buffalo Sabres find themselves in an unenviable position. The Sabres realize that Mikhail Grigorenko needs playing time, and he's not playing well enough to break into the top-six in Buffalo just yet. Because he's 19, the Sabres are forced to return him to his junior team, the QMJHL's Quebec Remparts. Grigorenko, however, has refused to report, stating he needs a better challenge than junior hockey. And Grigorenko is right. In 92 QMJHL games, Grigorenko has put up gaudy numbers. He has 70 goals and 69 assists in those 92 games, proving that he might be slightly beyond junior-level talent. Because of the agreement the NHL has with the CHL and AHL, players aged 20 and younger cannot be sent down to the AHL. There is the quandary that the Sabres face. What can they do? They can look at making an agreement with a European team, but not a KHL team due to the NHL-KHL friendly agreement. They are basically out of options in North America thanks to the CHL-AHL agreement. And Grigorenko continues to sit at home after the demotion. No matter what happens in this situation, the management of the Sabres did a pathetic job with an immense, unrefined talent that may never be realized as a Sabre. Saturday night in Sweden was a normal hockey night between Färjestad and Leksands. Leksands was ready to go for the face-off. The linesman was ready for the face-off. Färjestad was still getting organized. Here's a little tip, kids: if the linesman is ready to go, get to the face-off circle. Leksands' Gabriel Karlsson easily won the draw, checked out the Färjestad defensive zone coverage, and then fired the puck the length of the ice past a clearly unprepared Fredrik Pettersson Wentzel who was re-hydrating. Wentzel had no idea what had happened, and fished the puck out his net thinking that a fan had thrown it from the stands! This should teach Färjestad that when the linesman is ready, so are you. No harm, no foul in the end, though, as Färjestad won the game 5-1. That's all for today, kids. 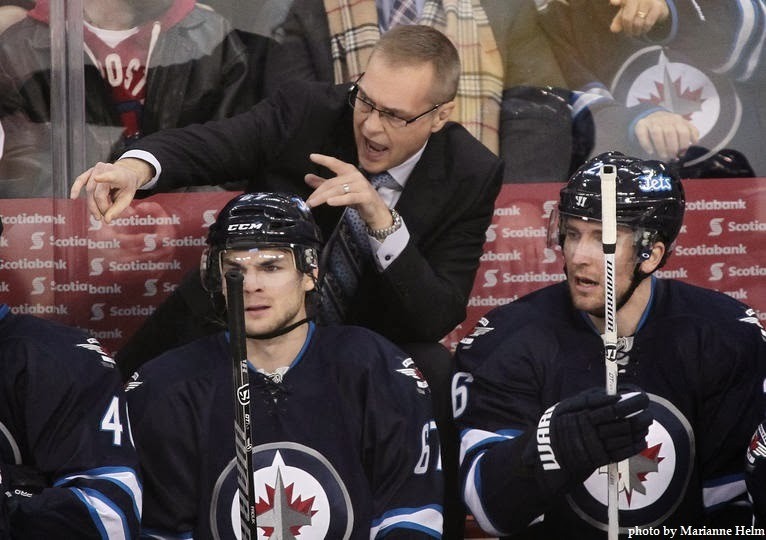 We get our first looks at the new Winnipeg Jets head coach tonight as Paul Maurice leads the Jets against the Phoenix Coyotes. I expect the Jets to show some real effort tonight, but the Coyotes will be a tough test for the new coach and his new team.